This is an outline of what needs to happen in yearbook class starting in May the year before through May the year the book is submitted and presented. 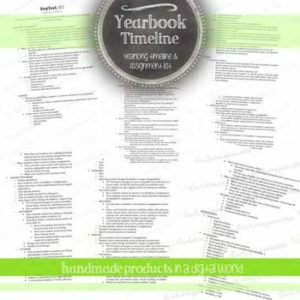 This yearbook timeline includes specific assignments, deadlines, homework, and what needs to be scheduled or submitted when. It also gives a breakdown of various assignments to various roles, including editor-in-chief, section editor, and staff members. This is also part of my yearlong yearbook bundle pack, available at a bundle discount price. This includes everything you need for your year of yearbook including handouts and yearbook planning worksheets. Check it out here. Check out my organization and information collection worksheets here. Check out my beginning of the year, yearbook worksheets (including syllabus and staff contracts) here. Check out my bundle pack of yearbook brainstorm worksheets here. Check out my first yearbook assignment of the year and intro to layout and design here. Check out the rest of my products here.